Quinn, in his first year, said he believes he is a better coach now than he was at the start of the season, and the staff will be better next season with a full year under its belt. 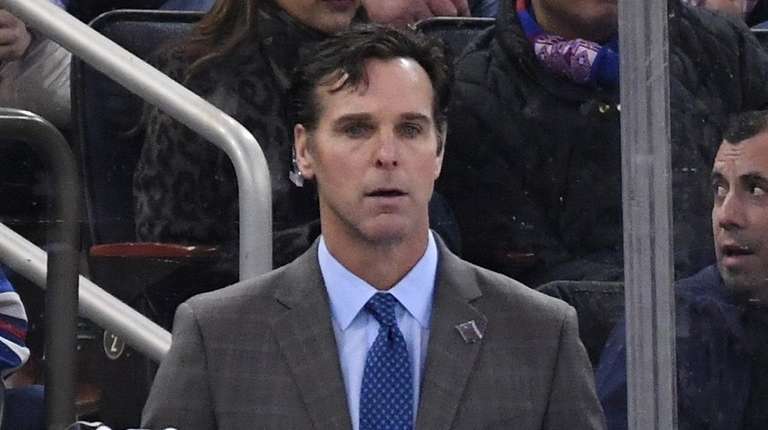 PITTSBURGH — As his first season as Rangers coach came to an end Saturday night against thePenguins, David Quinn said he knew what he was signing on for when he accepted the job and took over as coach during this team’s rebuilding stage. In the final game of the season for both teams, Ryan Strome scored the winner with 2:51 remaining in overtime. For the Penguins, the one point earned — combined with the Islanders’ win over the Capitals in Washington — meant they finished third in the Metropolitan Division and will face the Islanders in the first round, with the first two games on Long Island. The Rangers finished 32-36-14 for 78 points (20 points out of a playoff spot). Afterward, the Rangers sat in seventh in the pre-lottery draft order and had a 6.5 percent chance of getting the No. 1 overall pick. (Edmonton played a late game Saturday and the outcome could affect the Rangers’ lottery odds slightly). The lottery will be Tuesday in Toronto. After the game, Quinn said he thanked his players for their effort all season and in the finale. Quinn said he didn’t feel like the transition from coaching college hockey at Boston University to coaching in the NHL was a big deal, but he talked about how he was surprised by how “coachable’’ his players were. He said he believes he is a better coach now than he was at the start of the season and that the Rangers’ coaching staff as a whole will be better next season after a full season together. As the Rangers players meet with management Sunday for their breakup day interviews and the team plans for next season, Quinn said the one thing the Blueshirts need to improve is their defense. The Rangers gave up 264 goals entering Saturday, ninth-most in the league. They had scored 217 goals, tied with the Vancouver Canucks for 23rd most. They defended OK Saturday, for the first two periods at least. Sidney Crosby, who entered the game needing two points to get to 100 for the season, scored on a two-on-one break, one-timing Jake Guentzel’s saucer pass past Alexandar Georgiev for his 35th goal at 6:36 of the first period. But rather than folding, the Rangers got the equalizer when Brendan Smith — playing left wing — picked off a pass in the neutral zone and picked the top corner over Matt Murray’s glove hand for his fourth goal of the season (second as a forward) at 12:49. The teams were scoreless in the second period, but a total of four goals were scored in the third. Nick Bjugstad and Guentzel scored for Pittsburgh and Brady Skjei and Vladislav Namestnikov scored shorthanded for the Rangers. In the overtime, Crosby appeared to score the game-winner, but the goal was wiped out after video review determined that Guentzel had interfered with Georgiev on the play.